There are 2 reviews for 'Alphadia'. 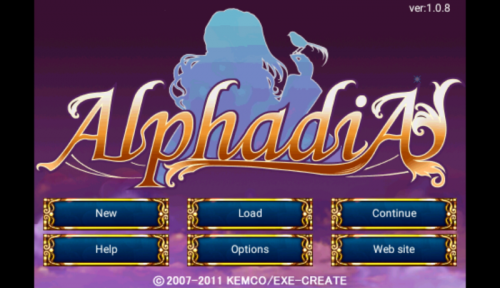 Welcome to Alphadia, a game that can virtually play itself! On the surface, there are some positives here. I liked the story. While the characters were overly verbose and awkward with their lines (in other words, perhaps a too literal Japanese to English translation), there were some decent twists and I wasn’t expecting the way this one ended. The dungeons could be described as a mixed bag. On one hand, they don’t hold your hand like so many Kemco games do. They’re not simplistic (many of the more modern E-C games have a lot of very linear dungeons; these are legit mazes), I don’t recall there being any sort of mini-map in these places to help me get my bearings and are loaded with traps such as fake floor tiles that send you down a level. But, man, they went a bit far at times, as with a few, it took an eternity to figure out how to navigate through them due to minor details such as doors simply disappearing when you find the switch that corresponds to them, leaving you to wander around aimlessly until you, by luck or perseverance, find the corridor they were blocking. When you add in this game’s annoying combat frequency, this easily leads to your party becoming over-leveled, making this game a breeze. After doing a couple dungeons, I wound up being able to beat all but the final boss and the post-game content bosses simply by hitting the auto-battle button. Heck, I don’t even know if my “skill system” rating could be considered accurate — not like I had to use those things too often! It’s not a “strongly don’t recommend” sort of game, as I liked the story and, if you’re playing a game like Alphadia Genesis 2, where you’re essentially having your hand held throughout each boring, linear dungeon, you might like the challenge of navigating these beasts — but I also don’t think I can recommend it either. Good story with a legit surprise at the end. It's actually not a breeze to go from beginning to end in dungeons. Battle frequency is through the roof. Game is hilariously non-challenging, as far as combat goes. Game can get hilarioiusly challenging, as far as navigating dungeons goes. …but still I love the story! The battles are way too easy, the dungeons are way too long, and the boss battles don’t need any strategy at all. Also the dialogue is… not translated very well. Yet in spite of all this, the story in Alphadia is one of my favorites, and it makes everything else okay. The skills system is okay; there’s nothing really good or bad to say about it. Die hard 2D RPG fans will probably love this game, but other players might be disappointed. Best Grinding spot for SP? Is Grinding to Level 99 Worth the Time?